master of all lawn and garden jobs! Simplicity Landlord (Mfg. No. 990314) with 42" Rotary Mower, with patented "Free-Floating" no-scalp feature. 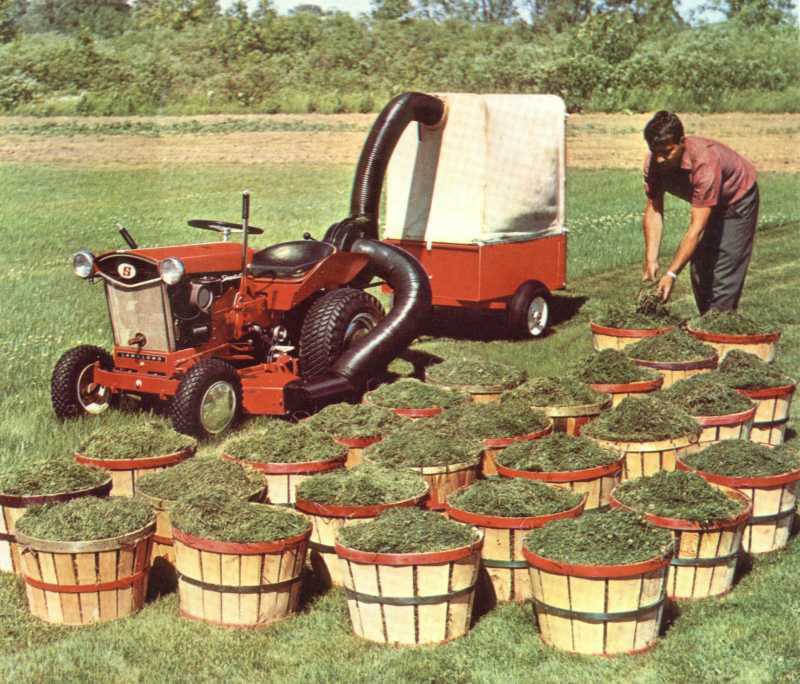 Master your land with the brawny, versatile, beautifully-designed Simplicity 9 HP Landlord! It's perfect for suburban homes, libraries, schools, large estates, farms, nurseries, service stations, country clubs ... anywhere a rugged, reliable power-partner is needed 12 months a year. Own a Landlord and you'll swear Simplicity designed it just for your convenience ... with a large deluxe bucket seat, a handy new parking brake, a new dash for more convenient grouping of controls, a gas gauge in the hood which permits a visual check of fuel without removing the gas cap, and many other "convenience" features. And this big burly brute of a workhorse is really built ... with an electrically welded heavy-gauge steel frame. It will take all the punishment you can give it, and come back eagerly for more. Landlord is engineered better than anything in its class. You get faster starts in any kind of weather with an Easy-Spin Starter and magneto ignition packing a 40 amp automotive battery and 3 stage voltage regulator. Nine dependable horsepower for get-up-and-go response in tough going, with three convenient power take-off positions, front, center and rear for unmatched versatility. Six mph top speed. Controlled traction differential so both wheels actually drive on slippery sidehills and icy sidewalks. Remarkable maneuverability. Plus a Softpurr Muffler that subdues engine noise without stealing horsepower. 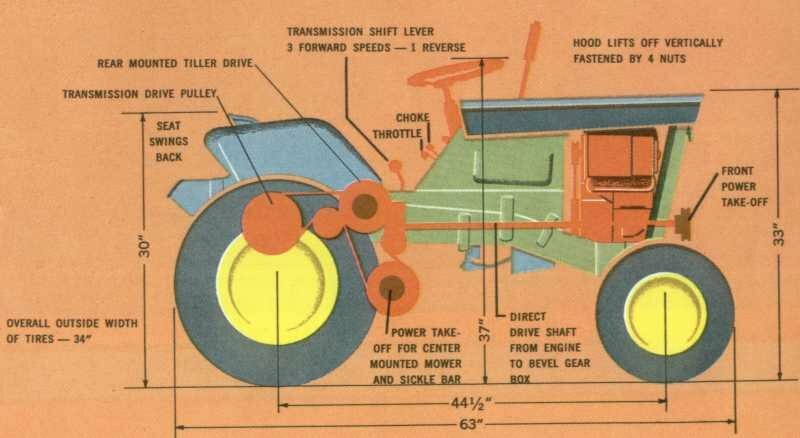 Landlord gives you many extras- extra power, extra performance, extra strength, extra features-- which stamp it as the finest; garden tractor in America today. And putting on or taking off its wide range of attachments is ... well, Simplicity. No one offers faster hitching of implements than Simplicity. You switch from one attachment to another in seconds, without tools. No matter what the job, Landlord does it well ... and in a hurry. It mows a velvety-smooth swath from 42" wide with the rotary mower attachment to 98" wide with the 5-gang mower.., shrinking even the broadest lawns to front-yard proportions. Landlord plows deep without balking, grades its level best, tosses aside wet and heavy snow with ease, hauls, tills, cultivates, grades ... takes command of all your outdoor work. Landlord has a quality that never quits, to knock the work out of over 20 tough jobs all year long. Isn't it exactly what you need? Engine: Briggs & Stratton 9 HP, 4 cycle, easy spin starting, heavy duty air-cooled, with micromatic ignition and mechanical governor. Transmission: Sliding spur gear and spiral bevel gear, oil lubricated, precision cut, carburized and hardened, mounted to anti-friction roller bearings. Differential: Spur gear, precision cut, carburized and hardened with built-in controllablefriction. Frame: Electrically welded, heavy gauge of new inverted channel type. Turning Radius: 2' inner rear wheel. Speeds: 3 speeds forward plus reverse. Gear ratios with standard pulleys. 156 in first, 66 in second, 40 in third. Gear ratios - with tiller pulleys, 194 in first, 82 in second, 50 in third. 1 to 6 mph. Tires: Front 4.80 x 8 studded-tread 2-ply. Rear 8-12 suburbanite-tread 2-ply. Electrical System: 12 volt throughout engine: magneto for positive starting even with dead battery. Automotive battery and ammeter, 3-stage voltage regulator. Power Take-Offs: Smooth power flow with 3 take-off positions (front, center, rear) eliminates costly extra engines.